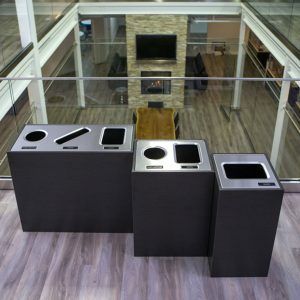 These recycling and waste bins are designed to maintain all of the practicality you would expect from a Busch Systems product, however they also add a stunning decorative touch to complement high-end boardrooms, offices, mezzanines, lobbies, etc. With a plethora of customization options such as color, signage and lid openings just to name a few, we can ensure that these exclusive recycling and waste bins will be perfect for your collection program. 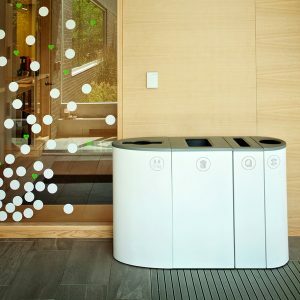 With designer recycling and waste bins, waste collection has never looked so beautiful. 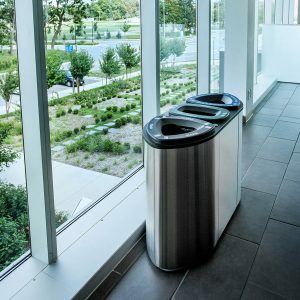 The Aristata Series is a bold new departure for waste and recycling bins – bringing style and sophistication to our current line of sturdy and versatile bins and containers. 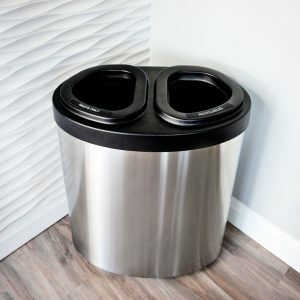 Designed to be on trend with modern interiors, the Aristata series retains the practicality, functionality and customization capabilities of a Busch Systems bin, but with modern finishes that integrate effortlessly into beautifully designed interiors. Recycling has never looked so beautiful. When you think recycling and waste container, the words “sleek” and “minimalist” probably aren’t the first to come to mind. 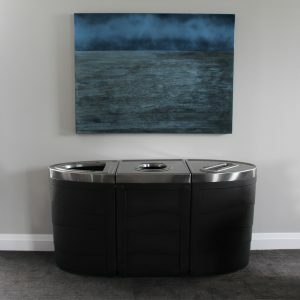 The Kovah is going to change any perceptions you have about how a waste and recycling bin can look. Designed to be an eye-catching addition to any lobby, retail outlet, boardroom or executive office, the Kovah still features the same functionality, customization capabilities and practicality expected from a Busch Systems bin, except in an incredibly sharp looking package.